Jeremy Clarkson was right when he said your Porsche 911 will finally kill you some day and here’s the proof. It killed its own professional factory driver! 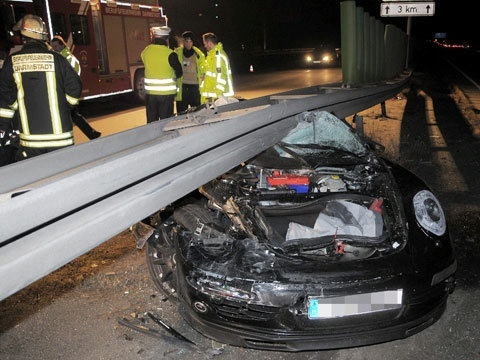 51-year-old engineer took a cabrio protorype for a night run in A5 autobahn but unfortunately it went badly wrong leaving the man dead. Apparently the driver lost control of the car and it wedged under the barrier killing the man. Witnesses say the driver was doing fairly high speed since this stretch on A5 has no speed limit. Another test driver was behind him in a Panamera who managed to evade the accident and escaped unharmed.